We often copy and past queries to work with them in different Query Windows. Let's say you have close all the Query Windows and would like to go to one of the query you had copied. You can use this feature to go back to 20 items you had copied to clipboard. This is great feature of SSMS, we can cycle through last 20 copied items. 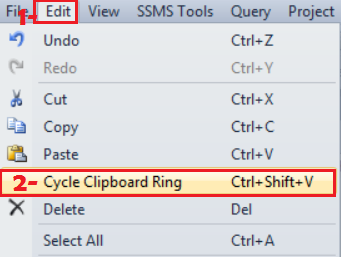 Important Note: If you would have closed the SSMS and reopened, you will not be able to cycle through Clipboard Ring. Open a New Query Windows in SSMS. Go to Edit Drop Down and then choose Cycle Clipboard Ring. This will paste copied query to new query window. You can keep repeating to go to previous clipboard copied items. Instead of going to Edit and then Cycle Clipboard Ring every time, we can use Ctrl+Shift+V shortcut to paste copied items from clipboard.